Images of the summer of 1952. 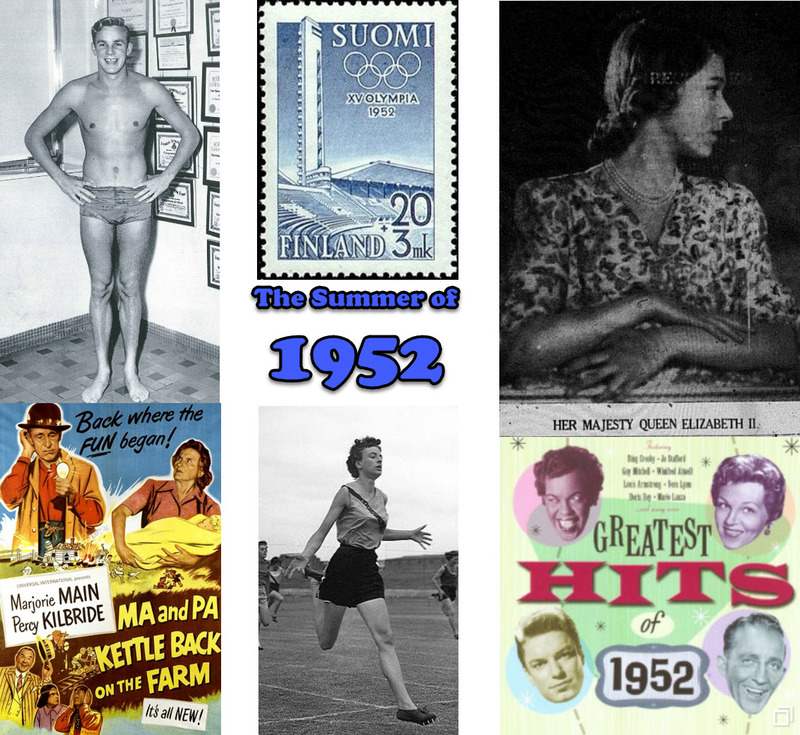 Clockwise from top left: a young Rex Aubrey who would become the first Olympian of the Parkes Shire; postage stamp for the upcoming Helsinki Olympic Games; Queen Elizabeth II; album cover for “Greatest Hits of 1952”; Marjorie Jackson competing in Sydney before representing Australia later that year at the Olympic Games; poster for “Ma and Pa Kettle Back on the Farm” which was showing at the Century Theatre in Parkes. 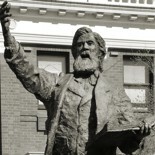 historyparkes is continuing our series of blog posts highlighting a particular period in the history of the Parkes Shire. This post will focus on the summer months of 1952. The biggest news occurred on February 6 when King George VI suddenly passed away. This marked the beginning of the longest running British monarch, Queen Elizabeth II, who is still on the throne at time of publishing. The summer heat was taking the usual toll on farmers and the land, with water shortages exacerbating the farmers’ plight and also the bushfires too. With 1952 being a Summer Olympic year, there was a real buzz that a local lad may be heading to Helsinki come the northern summer, swimmer Rex Aubrey. 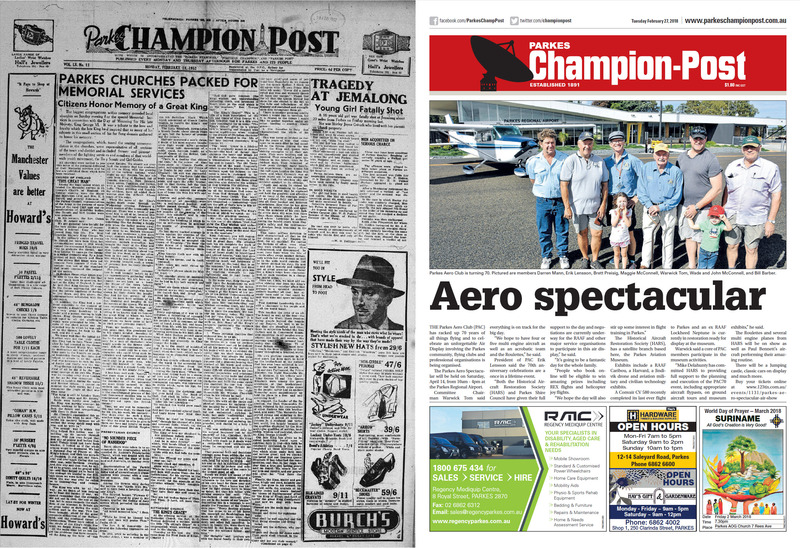 The Front Page – then and now! 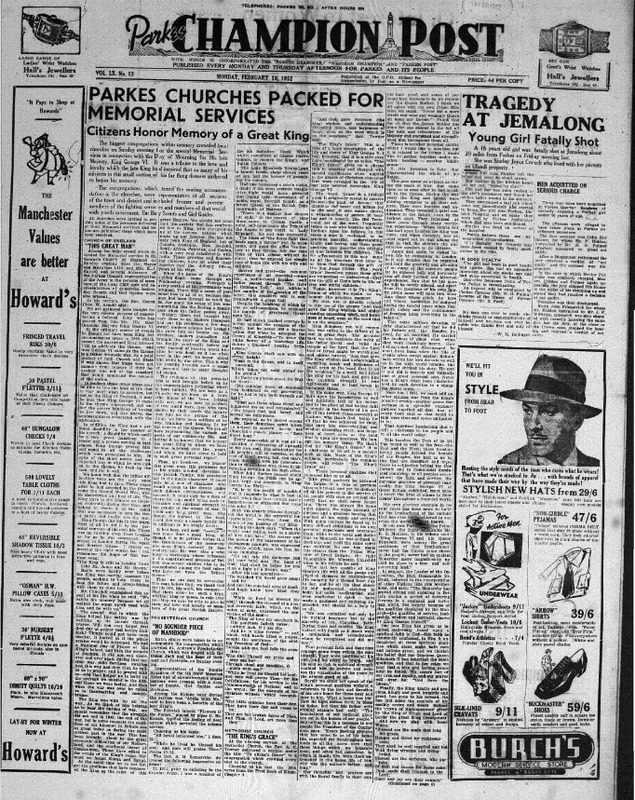 Two of the major department stores, Howard’s and Burch’s, continuously ran advertisements on the front page of the local newspaper. Occasionally there were additional ads inside the paper too. 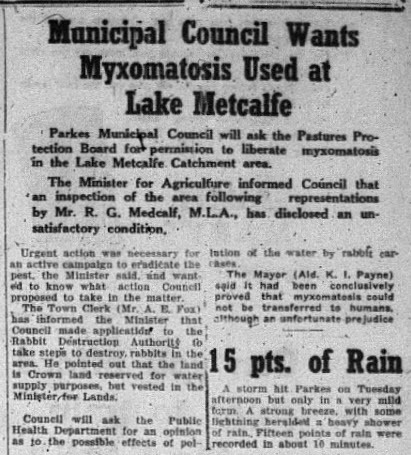 The local newspapers in the summer of 1952 contained similar stories of other Parkes summers – bushfires, drought and water issues. However there were stories particularly unique to 1952. The main topic was the sudden death of popular monarch, King George VI, and his successor, eldest daughter Elizabeth II. Rabbit populations were in plague proportions while water was so scarce that fire-fighters didn’t have enough to do their job properly! On the lighter side of the news, local languages teacher became President of the World Esperanto Congress and there were regular updates on two future Olympians, Rex Aubrey and Ted McGlynn. Click here to read Ted McGlynn – the Smiling Sprinter! 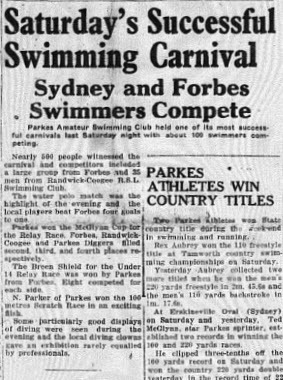 If you have stories of the summer of 1952 that you are willing to share please contact Parkes Shire Library via library@parkes.nsw.gov.au so that they can be shared and kept for posterity on this blog. Alternatively you may leave comments on this page. Rex Aubrey [Personal photograph]. (1952). Long Live The Queen! (February 7, 1952). 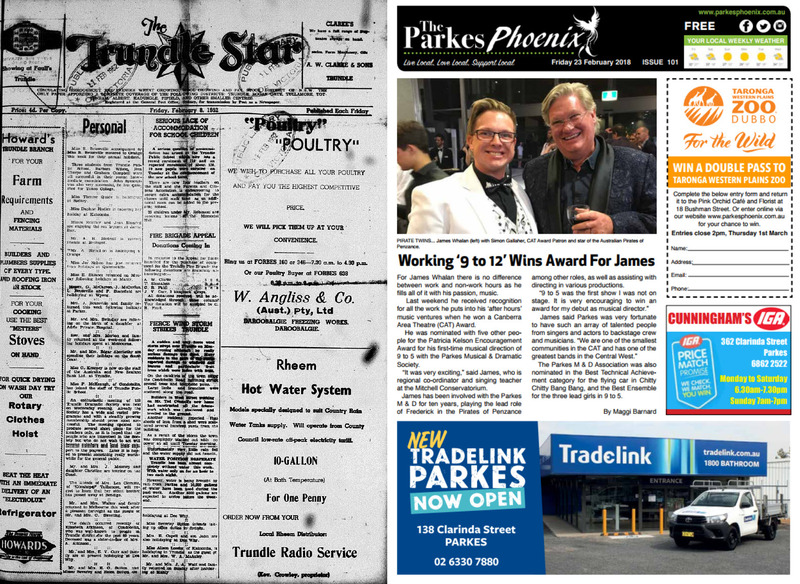 Parkes Champion Post, p. 1. Parkes Historical Society. (August 8, 2011). Kenneth Ivo Payne. 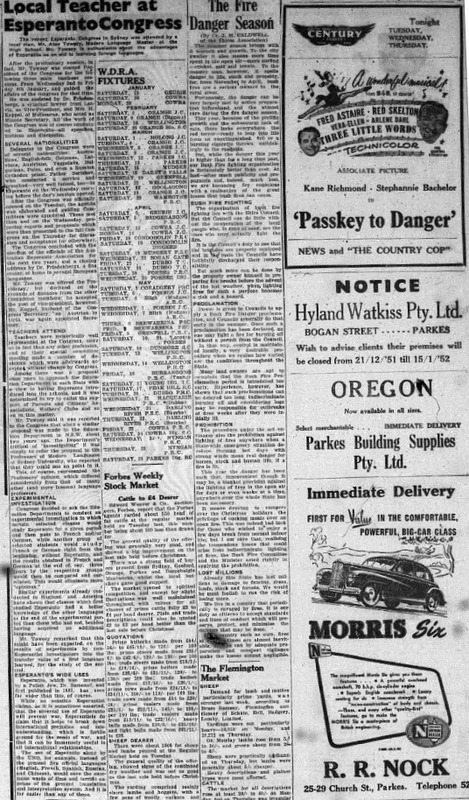 Parkes Champion Post, p. 6. Peters Ice Cream [Advertisement]. (February 21, 1952). The Champion Post, p. 6. Mobil Power Kerosene [Advertisement]. (February 21, 1952). The Champion Post, p. 6. 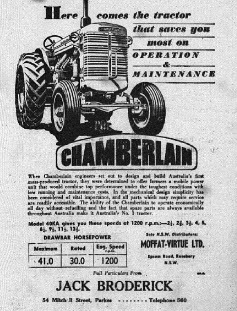 Chamberlain Tractors [Advertisement]. (February 7, 1952). The Champion Post, p. 9. 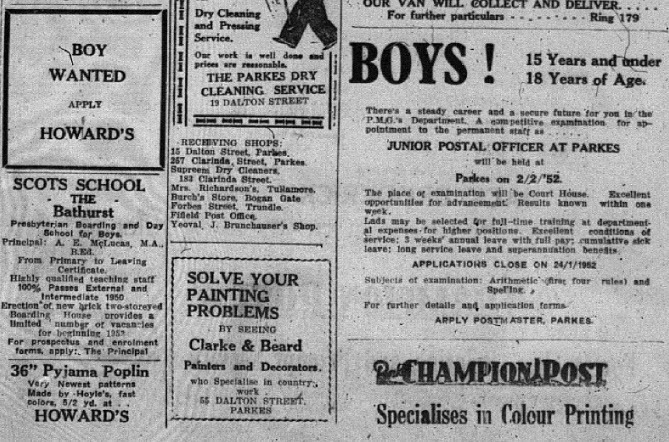 Boys Wanted Apply Howard’s [Advertisement]. (January 10, 1952). The Champion Post, p. 5. 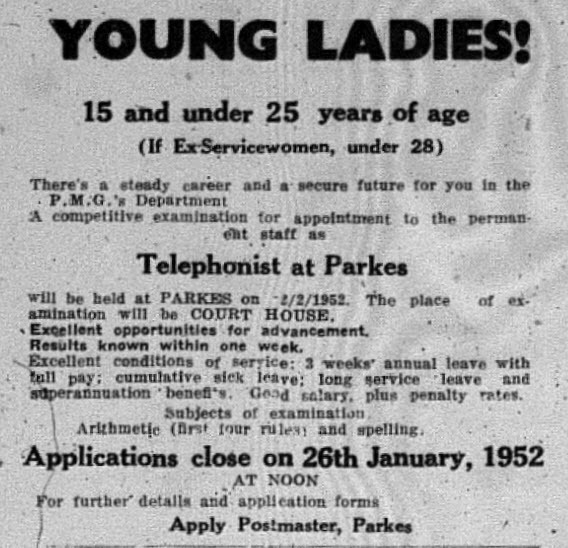 Telephonist at Parkes Wanted [Advertisement]. (January 14, 1952). The Champion Post, p. 4. 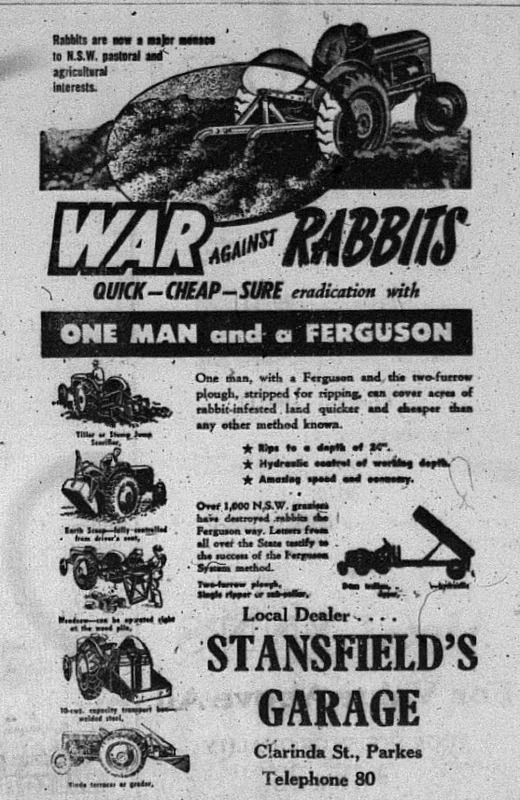 War Against Rabbits [Advertisement]. (January 17, 1952). 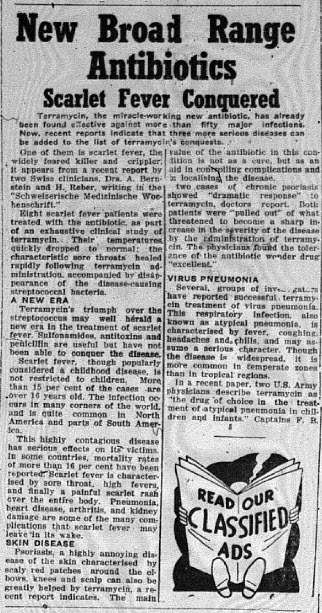 The Champion Post, p. 5. 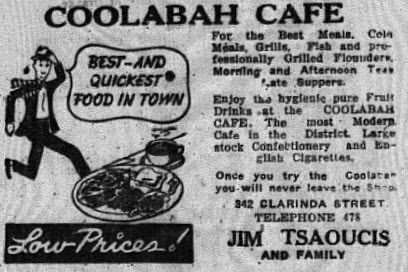 Coolabah Café [Advertisement]. (January 17, 1952). The Champion Post, p. 7. Radiola Senior 4 at Kendall’s [Advertisement]. (January 21, 1952). The Champion Post, p. 2. 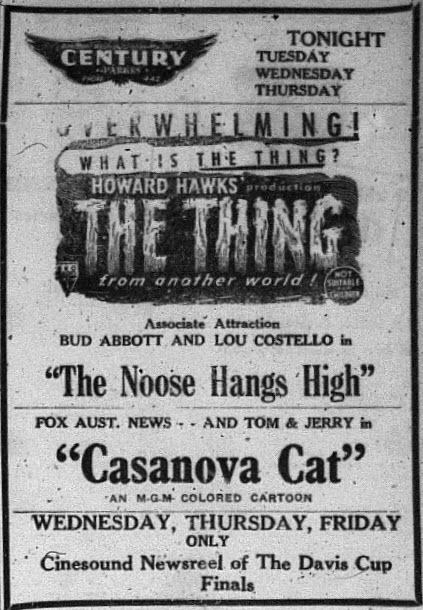 Century Theatre Feature [Advertisement]. (January 21, 1952). The Champion Post, p. 3. 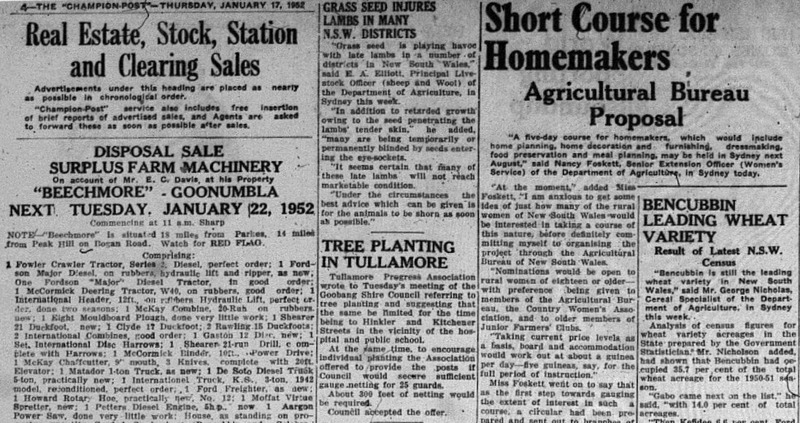 This entry was posted on March 9, 2018 by parkeslibrary in 1950s, 1952 At A Glance, 1952 Newspaper Advertisements, A Look Back At... The Summer of 1952, General history, local historical articles, Making Local News in 1952, Newspaper Advertisements, Parkes Library Family & Local History Resources, The Front Page... then and now!, Uncategorized and tagged 1952 Helsinki Olympic Games, A Look Back At... 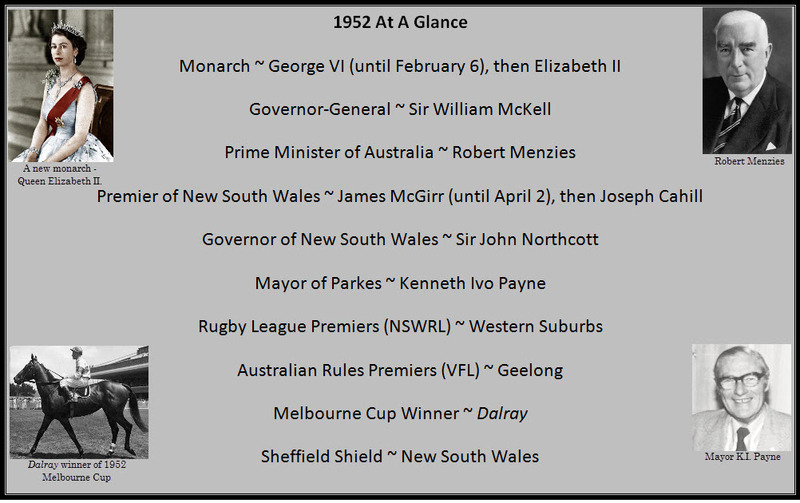 The Summer of 1952, Abbott and Costello, Alan Towsey, Bencubbin, Burch's stores, Casanova Cat, Century Parkes, Century Theatre Parkes, Chamberlain tractors, Coolabah Cafe, Dalray, death of a monarch, Esperanto, Greatest Hits of 1952, Howards Stores, Jack Broderick, Jim Tsaoucis, K I Payne, Ken Ivo Payne, Kendall's, kerosene, King George VI, Lake Metcalfe, Ma and Pa Kettle, Ma and Pa Kettle Back on the Farm, Marjorie Jackson, Mayor Payne, Mobil kerosene, Morris Minor, Morris Six, myxomatosis, Parkes 1952, Parkes Champion Post, Parkes churches, Parkes Phoenix, Parkes Shire, Peters ice cream, Postmaster General, Queen Elizabeth II, R R Nock, rabbit control, rabbit plague, Radiola Senior 4, Rex Aubrey, Rex Aubrey swimmer, Robert Gordon Menzies, scarlet fever, Stansfield's Garage, sudden death of King George VI, Ted McGlynn, terramycin, The Thing, Tom and Jerry, town water, Trundle Star, Tullamore, Tullamore Progress Association, war against rabbits, World Esperanto Congress, Wrigleys spearmint gum.